Not even sure how that is possible considering that last year I definitely shared soup with my invisible internet friends almost once a week. But then it got all warm and if there is anything I loathe, it’s heat. Like temperature heat. It became impossible for me to want soup as often as I did in the cooler months. Then the season changed and it was like BOOM. My everything wants soup. My body, mind, soul – you know, all that stuff. Be prepared: soup once a week. Mostly likely. A few weeks ago when I was standing in line at the self-checkout in the grocery store, I grabbed the Cooking Light shortcuts issue and flipped through. My eyes immediately landed on the thai butternut soup and I was sold. I needed that magazine. And it was like ten freaking dollars. What? Whyyy. Have we ever discussed my magazine obsession? Well, if not – I have one. A serious one. I don’t know what it is, but I LOVE magazines. I love relaxing with one on the couch or even reading one before bed if I am not engrossed in a novel. And my interests range from food to business to style to home stuff. They are like pinterest but better. They don’t stress me out and make me hate life or feel worthless as much as pinterest does. Plus, you can rip out the pictures and have a real life inspiration board in case your internet crashes. Win. I like to read old magazines too. That should come as no surprise since I’m usually five years behind with everything. Anyhoo – that’s where I got the soup idea. I only made a few changes but this is so flipping fabulous. It’s creamy and smooth but not souper (I mean, super) thick, which makes it an awesome transition meal from summer to fall. Especially since it’s still a little warm at times. AND and and it uses one of my favorite ingredients, coconut milk. I don’t even know what could make this better. Perhaps a little spice if you’re into freaky things like that? GAH. I just love this. Not much else to say. For once. Oh except wait until I tell you about the bread I dipped in it. YEAH. I like your Picture so much ! Can’t wait to try this. Your pictures are so stunning! I can’t wait to see your cookbook. A true piece of art! Going on my to-make list. Love the Thai flare!!!! Hmmm, you just tapped into my two main obsessions in life. Soup and magazines. I just ordered 12 magazines for monthly subscription from Pia’s school fundraiser. Think that might be too many to get through each month? um, we are so twins. i just ordered 10 through a school fundraiser too. !!!! My mom and husband told me it was a sickness. Love soups too though for years only thought of ‘soups’ as really two. French Onion and Chicken with Dumplings. Root vegetables sounded boring. Then I made a carrot soup with some heat and everything changed…this one sounds right up my alley. I’ve been wanting to make soup for like 2 weeks now and I not done it! I must try this! You photographed the soup beautifully too. This sure is soup time of year. Once the weather starts getting cooler – squash soup sounds like the perfect meal. I love this curry version with coconut milk and cilantro YUM! What a comforting bowl of soup! Love the thai kick too! I made this tonight! My whole family loved it. I cut the curry in half as I have spicy-sensitive kids. Next time I’ll add more, I love spice. Thanks for the amazing recipe! you could use whole or 2% milk, half and half, heavy cream, maybe even greek yogurt?? This looked so good I had to try it right away! It’s simmering at the moment and it smells so good. I didn’t have curry paste so I used green curry powder, I’m not sure of the difference but it smells great. Thanks for the post, it’s just what I was looking for. I love the Thai flare as well. My little picture icon is of coconuts drying on the beach in Thailand. Pingback: Knives vs. Thumbs: Never take your thumbs for granted. I made this soup last night – super quick, easy and delicious. How many butternut squash does it take for 4 cups of cubed squash? I already have all the ingredients I need to make this yummy soup and one butternut squash sitting on my counter….. I only used about half of one squash to get 4 cups. It was a typical sized squash about 10 inches long. I’ll roast the other half later and put butter and brown sugar on it! Just made this tonight and it was so awesome. My I-hate-anything-with-ginger husband loved it. Used lite coconut milk and served with seared scallops. Im stoked I get to eat it for lunch this week. every single day. I made this soup 3 times already since I saw it on pinterest. I love it. Today I made a double batch and it came out good but on the thin side. I did not have extra butternut squash so I poured myself a cup and added peanut butter to thicken it along with crushed plain bagel chips and topped it off with cilantro and it was fabulous. This recipe is a keeper. Mmm, I love the peanut butter idea!!! I may have to steal that. What is the nutrition information for this soup? I just have to say I made this last night as I didn’t want my squash to go bad. And it turned out fantastic! I had once made a butternut squash soup and my then boyfriend and I almost barfed it was so bad. This, however, was perfect! My now husband and I cannot believe how awesome this turned out, especially after my last disaster!! This will become a regular dish for us. You rock! Pingback: Squash: The Underdog / Blog / Need Supply Co.
How big a squash do you need for that 4 cups? Will one smallish squash do it, or do you need to go bigger? My squash was a hair over two lbs (2.15 to be exact) and it was a pretty perfect four cup amount after seeding and peeling! Standing in my kitchen having just finished making this…it’s even better than your butternut squash soup, and THAT is also wonderful! I’m so inspired by your food! You have a unique taste that I just love. Can’t wait to see what else you come up with! just made this – SOOOO GOOOOOOD!!!!!!!! I love soup – you should do Soup Sunday posts!! Such a fun, relaxing thing to make. My boyfriend thinks I am crazy for spending hours making soup (until he tries it). 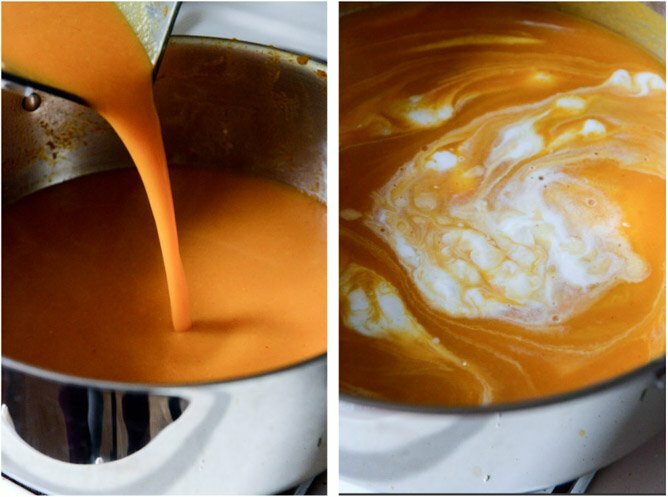 Just wanted to say, I’ve made a load of pumpkin/squash soups before, but this is an awesome recipe, one of my favs!! Mine turned out unbelievably spicey! Do you use Thai Kitchen brand red curry paste? That brand recommends 1/2 T to 1 T for a sauce. Ack! What can you do if it’s too spicey? Just wanted to leave a note- I tried this recipe as a result of a Pinterest whim and it was AMAZING! Thank you so much for posting- it was just perfect for a chilly Autumn weekend evening :-) I’m looking forward to reading your blog regularly! I have a few mystery squashes from my mom’s garden. They are green on the outside and yellow on the inside. How important is it to use butternut squash for this recipe? i made this and it was Le Bomb.